Here's a third and final Physics in Verse poem for you. It's technically the lyrics of a song, but I love the fun and memorable way it presents science about our Sun. The Sun Song is the only way I can remember trivia like "a million Earths could fit in the Sun" or "it's six thousand degrees at the photosphere". This song hails from a nerdy music group called The Chromatics, and features on their astronomy-inspired album, AstroCappella - "an astronomy class set to music" according to Sky & Telescope magazine. You can listen to their groovy recording here. To learn more about the inner workings of the Sun, check out The Chromatics' background science page. To see what the Sun is doing right now, visit NASA's Solar Dynamics Observatory website, The Sun Now. The image at the top of this post shows the Sun on June 11th, 2015, with the different colors representing different parts of the solar corona. 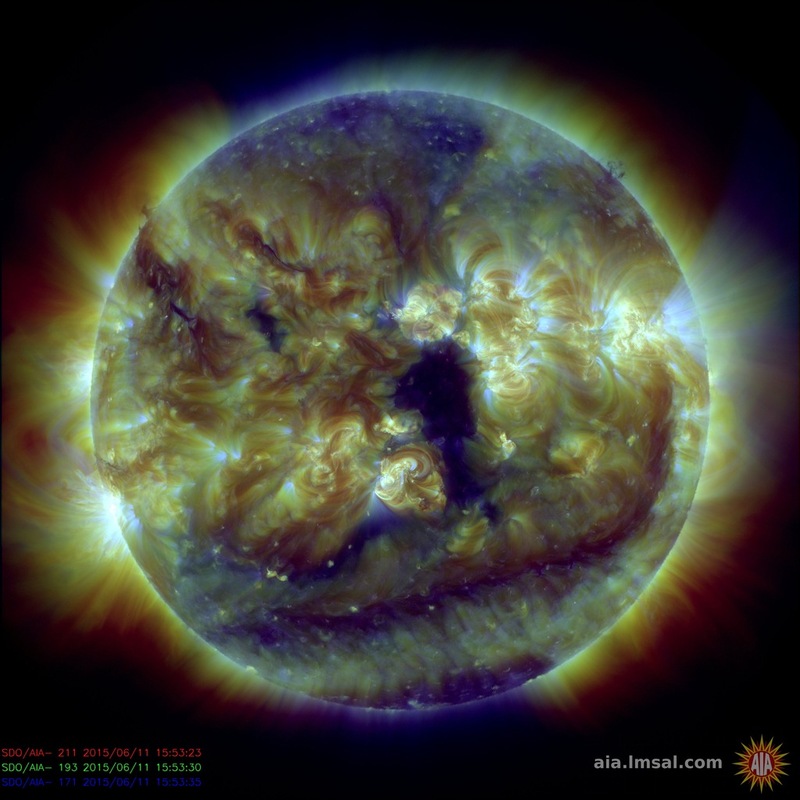 Solar wind from the large dark "hole" in the center of the Sun is expected to reach Earth this week. Top image credit: The Sun in June 2015. A composite image showing different parts of the corona. Courtesy of NASA/SDO and the AIA, EVE, and HMI science teams. Many people have found it very interesting to give an expression of their ideas through the art of writing. However, for an article to emerge very interesting, captivating and good to read, there are some aspects that should come into place. This is because, for an article to be termed as high quality there has to be proper flow of ideas and a story line that can be easily followed. This article meets all these requirements. Thanks for sharing this excellent piece of writing with us!